Incredible view, charming, private, feel good 2 bedroom, 1 large bathroom cottage on the beach in Maple Bay British Columbia. Completely renovated, open concept living space. New furnishings, lush bedding, completely vacation/move in ready. The cottage is walking distance to beach, gov't warf, pub, Maple Bay Rowing Club. A longer walk to Maple Bay Yacht Club, and Maple Bay Marina. Cowichan Golf and Duncan Meadows are 10 min drive. Downtown Duncan is 10 minutes as well. Cowichan Rugby Club, 2 minute drive. Brentwood and Shawnigan Colleges, 20 minutes. Our family has lived in Maple Bay for over 40 years. With the family's active social/community life, in Rugby, The MB Rowing, the MBYC, and golf clubs, we have hosted guests from all over the world. One of the last standing cottages in Maple Bay! Our family has loved this cottage for over 40 years, and we would love to share it. Everyone we have hosted cannot get over the welcoming comfortable feeling that the cottage exudes. Large parking area able to accommodate a camper. Fireplace insert. Kindling and firewood provided. One sofa, 2 occasional chairs. Open concept. Eat in kitchen. Dining table seats 6 comfortably. Some board games and cards. There are a few toys around. More if you request. Kayak rental place three houses down. Large uncovered deck with outdoor dining set. The cottage is all on one floor, and is level entry. It is a gravel driveway. Portable crib and other baby equipment available upon request. We are proud, very active members of our community. We live 3 blocks away from the Beach House. The quickest way to reach us is by text message. Spent the weekend at the cottage and had a great stay! The hosts were super helpful, providing us with firewood and clearing the snow in the driveway. The space was perfect for five and was well equipped with everything we could possibly need. The views of the bay and the mountains really made our stay extra special and memorable! This was our second visit and both times we were very sad to leave this special place. Beautifully decorated and cozy cottage. The setting and view are unbeatable. We only had four days, wished we had all week! The photos didn't really do it justice, very quiet and atmospheric place. Lots of nice touches like the USB ports and decor. Loved that we could take our trusty labrador down to the beach for a swim each day. Would like to go back and have Gudy take us on his boat to see more. The Scottish pub has an amazing deck but has a "Stone Age" pub license so no teenagers allowed. Food wasn't that great either but there are other nice places to eat in the other bays. Check was easy, the cottage was nice and clean with everything we needed. Close to town and a nice Pub, as well as the beach and Marina. Thanks for everything. We loved our stay at Maple Bay the beginning of November. The cottage had everything we needed, and more! The fireplace was wonderful, we had it going all the time, the beds were very comfy, the views were wonderful, the place was very accessible for anyone with mobility issues. Our hosts had the fire going and flowers on the table to greet us. We ordered pizza from Duncan one night and they delivered to the cottage. There is a pub just down the hill, and a nice little restaurant, the Shipyard just a five minute drive at the main Maple Bay marina. 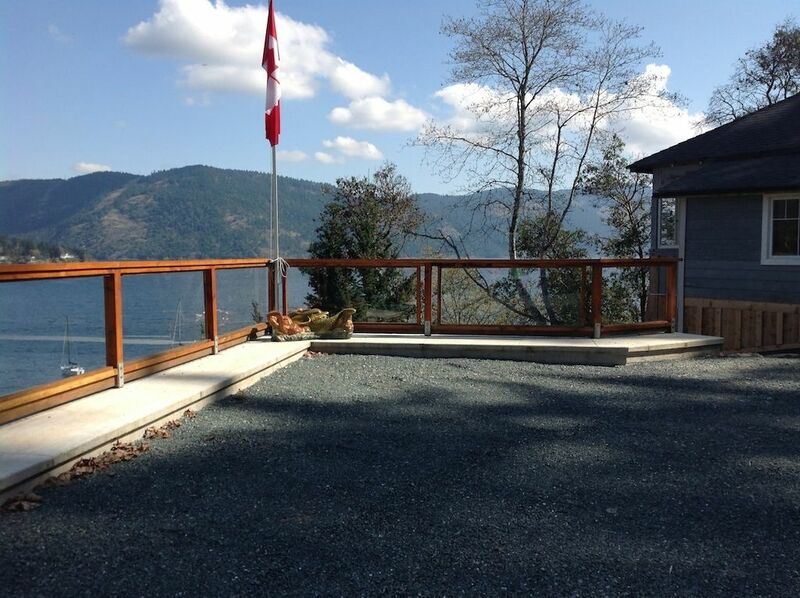 Would definitely recommend to anyone looking for a vacation rental on the water near Duncan! I am home now and already miss being at the cottage. This peaceful sea side home is a place of refuge if that is what you are looking for. Views from every window, sea lions in the bay, an heron nesting in nearby trees, deer nibbling on grass... coffee on the deck as you watch the sun come up over the mountain tops and wine as you much later watch the Big Dipper rise on a starry starry night. I loved it and will return often. Thanks to my hosts - I did not want for anything. This is a little piece of heaven. Thank you for sharing. Incredible view, charming, private, feel good 2 bedroom, 1 large bathroom cottage on the beach in Maple Bay British Columbia. Completely renovated, open concept living space. New furnishings, lush bedding, completly vacation/movein ready. Our family have loved this cottage for 40 years, and would love to share it. Our family has lived in Maple Bay for over 40 years. With the family's active social/community life, in Rugby, The MB Rowing, the MBYC, and golf clubs, we have hosted guests from all over the world. Everybody can't get over the welcoming comfortable feeling that the cottage exudes. The cottage is walking distance to beach, gov't warf, pub, Maple Bay Rowing Club. A longer walk to Maple Bay Yacht Club, and Maple Bay Marina. Fine dining at the Quamichan Inn is 2 kms. Cowichan Golf and Duncan Meadows are 10 min drive. Downtown Duncan is 10 minutes as well. Cowichan Rugby Club, 2 minute drive. Brentwood and Shawnigan Colleges, 20 minutes. Your host would love to take you fishing, prawning, crabbing. Gudy is famous in the Cowichan Valley for his character, fishing, and rugby. Take in a rugby game, a rowing regatta, a golf game, or just show you around. We are proud, very active members of our community. We live 3 blocks away from the Cottage.